Friday 26th October 2018 - The Royal Shrewsbury Hospital, The Shropshire Education and Conference Centre (SECC). Come along and have a chat with the senior nursing team, undertake assessments, have an interview and leave with a provisional job offer and the excitement of joining our family! Don't worry if you can't make this date, we can arrange for you to be interviewed on an alternative date. 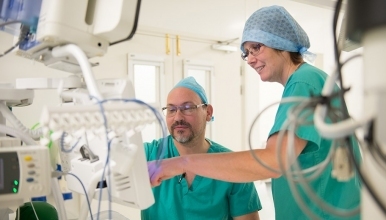 We are currently looking to recruit dynamic, enthusiastic, motivated, forward thinking Nurses and Operating Department Practitioners to join our Theatre teams. You must be a Registered Nurse or ODP, and have a real drive and enthusiasm for a career within Theatres, or a student ODP approaching the end of your training. The Royal Shrewsbury Hospital consists of 11 Operating Theatres covering a range of major and day case surgery including Colo-Rectal, Urology, Upper Gi and Bariatric, Vascular, Ophthalmology, ENT and Max Fax, Trauma Orthopaedic and an Emergency CEPOD theatre 24/7. The Princess Royal Hospital, Telford comprises 8 Operating Theatres, again covering major and day case surgery including Gynaecology, Breast, ENT and Max Fax, Trauma and Elective Orthopaedic, Emergency CEPOD and also provides staff for the Obstetric Theatre in the Women and Children’s Centre. You must be a Registered Nurse or ODP, and have a real drive and enthusiasm for a career within Theatres; student ODP’s and Nurses approaching the end of their training will also be considered. You will be required to cover a range of shifts which may include Weekends, Late Shifts, Bank Holidays and On-Calls. There are currently vacancies on both sites and while the successful candidates will predominately work at one site, there may be a need to cover shifts at the other. You should demonstrate in your application a desire to develop your career within a Theatre setting and have the enthusiasm to teach / mentor in the future. As part of our vision to provide the best care to our patients, we are looking for talented and passionate Practitioners who share our values and who want to grow with our organisation. This is reflected in our selection processes which now includes an Assessment (Drug calculations/Literacy and Numeracy) and a values-based interview.